Today, when you bite into a Wiener Works hotdog, you are enjoying the very same hotdog eating experience that was served up in 1973. Locally owned and operated for 30 years, Wiener Works has worked hard to ensure the customer feels like the boss everytime they come by. This translates into a "highlight of your day" type experience. And how good are the hotdogs? They've been voted Reader's Choice for Best Hotdog year after year. So stop in and try one for yourself. 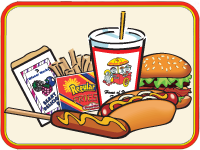 While you're there, sample a tasty burger, the famous Fry Delight or any of Fayetteville's favorites ! Wiener Works is always seeking applicants for various jobs. See what's available and download an employment application online.